Missing teeth can have a detrimental effect not only on the function of your mouth, but also on your confidence and self-esteem. People who have lost teeth may find themselves smiling with their mouth closed, or changing the way that they talk to avoid opening their mouth wide and revealing their missing teeth. However, thanks to innovations in modern dentistry, it is now no longer necessary to live with the effects of tooth loss. Dental implants are a restorative and cosmetic solution for single or multiple missing teeth. They provide strength and function of a regular tooth, yet look completely natural, blending in with your other teeth so that they are virtually imperceptible. They have two main components: the visible portion of the tooth, and the implant base. The visible part of the tooth takes the form of a color-matched porcelain crown, which is specifically designed and created to fit with the shape, size, and shade of your existing teeth. The implant base is a titanium post, which is inserted through the gum and into the jaw at a pre-determined location, where over time it fuses to the bone. 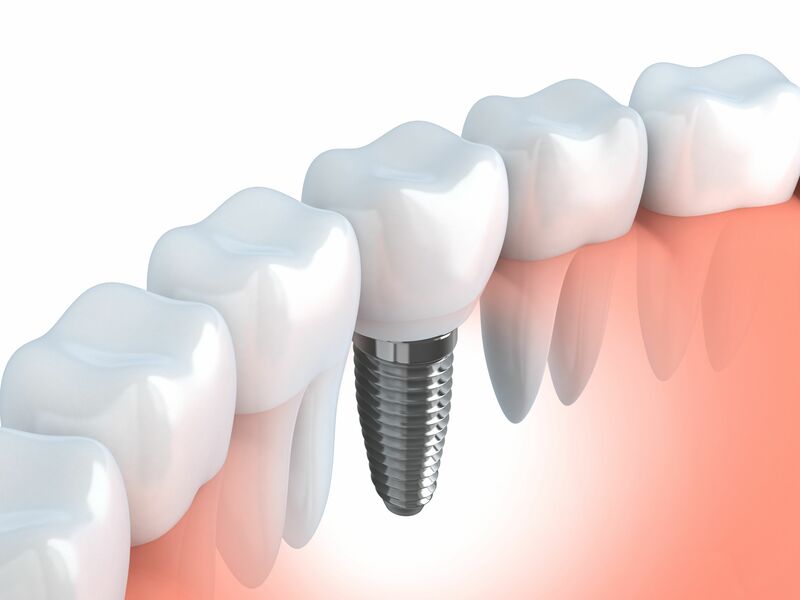 This creates a permanent and secure foundation for your dental implant. The crown and implant post are attached to one another using a special connector called an abutment. While dentures are well known for moving around in the mouth and drawing attention to their presence, dental implants are permanent. This means that they will be secure in your mouth, meaning there will be no embarrassing slips, and no one will realize you have false teeth. With dental implants, you can eat or drink whatever you like with no fear of your teeth moving. You can also talk, cough, laugh and sneeze meaning that there are absolutely no compromises on your lifestyle. Unlike dentures, which must be removed to be cleaned, you can treat your dental implants exactly like your regular teeth. This means they can be brushed and flossed every day, which will help keep them looking as good as the day you received them. The titanium posts used in dental implants have the highest success rate of any surgically implanted device at around 98%. If you follow a good brushing and flossing routine and make all of your regular dental check-ups, your dental implants could last you a lifetime, making them a solid investment in your long-term oral health. The process of receiving dental implants will require several visits to our offices including a consultation appointment with our surgeon, Dr. Le. During the first part of the procedure to actually place your implants, the implant posts will be inserted into their pre-planned locations in the jaw bone. However, your permanent crowns will not be attached at this time. Instead, you will be fitted with temporary crowns, while your implant posts are given time to fuse with your jaw bone in a process known as osseointegration. Once Dr. Le is satisfied that your implant posts have healed into place, you will be fitted with your permanent crowns. Although extremely successful in the majority of cases, dental implants are not necessarily the best solution for everyone. If you are missing one or more teeth and are interested in finding out more about dental implants, you will need to attend a consultation appointment with our surgeon, Dr. Le. After an examination of your mouth, teeth, and jaw bone, we will then be able to determine if dental implants are the most effective solution for your dental needs. At Le Smile Dental Center, we are committed to providing patients with the best quality dental care possible. Dr. Le and our team at Le Smile Aesthetic and Comprehensive Dentistry have the knowledge, skill, and experience necessary to deliver outstanding dental implant service to patients in and around Vienna, VA. If you have any questions about dental implants or any of the other services that we offer, please do not hesitate to get in contact with our friendly, reassuring team. They will be happy to answer your questions and schedule an appointment at our modern, comfortable office.